Photo: Teaching a dog to drop it ! The drop command is similar to the leave command but used when the dog has something in its mouth that you want them to immediately release. This command is especially important with puppies as they pick up anything and sometimes it could be something hazardous or even potentially poisonous. They are not always close enough to you for you to grab it from them and if you try and chase them they just think it is a game and could swallow or choke on the item in their mouth. You can also use drop when playing games like fetch or tug to get them to release their toys. The drop command is also helpful for dogs who have a tendency to be possessive. There are several different ways of teaching a dog to drop, but most effective is to have something ready to give your dog that is more appealing than what you want your dog to drop. You can use clicker or a key word (such as "yes") as a cue for when your dog gets it right. To start off, as always, place yourself in a quiet room with little distraction. Have plenty of really yummy smelly treats to hand and a couple of toys you know your dog really likes to play with. Put a treat in one hand, holding a toy in the other. Offer the dog the toy and let him play a little. Then put your hand on the toy whilst it is in your dogs mouth and say drop, at the same time offering your hand with the treat in it. The majority of dogs can not resist a nice yummy treat and will naturally drop what is in their mouth. If your dog does say “yes” (or click if using a clicker), give your dog the treat and lots of praise. Then pick up the dropped toy and offer it back to your dog, you could say “take” at this stage, he will be learning 2 commands in one go. 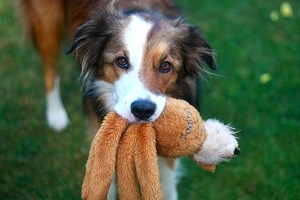 Let your dog play with the toy and get a little involved yourself by giving a few gentle tugs, but at the stage be careful not to excite your dog too much as you want it to succeed. Then repeat as before. Do this a few more times and then end the training session on a good note. You should come back to this exercise between 4 hours and 1 days time (don’t leave it too long). If you keep your treats handy, during the day so you can practise the one off “drop” command when your dog picks something up, but make sure to always reward and praise when the command is obeyed. Sometimes you will find that you want your dog to drop something that you can not allow it to have again, this is fine just be sure give extra rewards and substitute the dropped item for a toy and play, which will take your dogs mind off what it had. Once your feel happy that your dog is obeying the drop command in this situation you need to make it a little more testing. I recommend you move onto choosing an item that your dog loves to steal. Most puppies have favourite things they love to steal… mine couldn't resist, slippers, shoes, socks, pens and sunglasses (amongst other things). Generally when they steal an item and you move towards them they run off, so you are best off putting them on lead for this. If you chase them they just think it’s a game and get too excited to listen. Do the same sequence as before and practice it often inside and outside the house. Then you can try it on food, it has to be something that can not be swallowed quickly. So get a large piece of paper and smother it in something smelly and roll it up. Give it to your dog and once in his mouth immediately asked him to drop – if your dog does, say “yes” give him several really yummy treats, which must be more appealing than what you put on the paper,and loads or praise. Continue practising this in different environments. You will find yourself just automatically using the drop command several times during the day. Once your dog has learnt drop, be consistent and only say it once and always see it through. Note: some people say “drop it", initially I try to use one word commands wherever possible, as they are clear and concise. It’s fine to add on the suffix once your dog knows what drop means.